How to check Your Real backlink of any website. Before checking backing, I will tell you what is backlink? Backlink is a hyperlink from on web page to point other web page, It is a search engine optimization term (SEO) that is also called Inbound Link. Backlink is the most important factor of popularity of any website. Backlink that have rel=” nofollow ” attribute is called no follow backlink. Most important thing about no follow backlink is that search most of engine does not consider no follow backlink link for ranking of any website. The backlink that does not have rel=”nofollow ” attribute is called do follow backlink. Only do follow links are consider by the search engine. Now I am going to tell you how to check do follow backlink of any website. Open google web master tool and sign in with your google account. If your website has been added in google web master tool then ok otherwise add your website first to google webmaster tool. Select you’re your website, which you to check backlink, here I am selecting blogs.ptutorial.com. 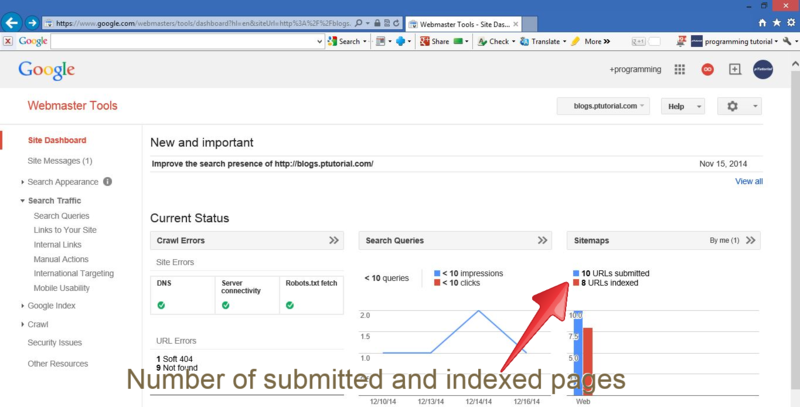 You can see here number of submitted and index page of your website. Now click on search traffic then after links to your site. This is your real backlink or you can say that, there are the do follow backlink of your website. Note: If you add your website to google webmaster today then it takes around seven day to update your all data like backling. Note: If you have been added some time before then it takes 24 to 48 hours to update todays backling. This entry was posted in seo and tagged backling, ptutorial, search engine optimization, seo on December 27, 2014 by Umar Farooque Khan.